When I was digging through Wikipedia for information for that last post about karate ranks I noticed an interesting thing. 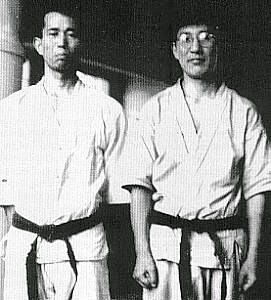 Tomiki was one of the early students of the founder of aikido Morihei Ueshiba, beginning in 1926, and also of Jigoro Kano, the founder of judo. In 1928 he obtained 5th dan in judo and in the following year he represented Miyagi Prefecture in the first judo tournament held in front of the Emperor—this tournament became the All Japan Tournament the following year. From 1936 till the end of the second world war he lived in Manchukuo (Manchuria) where he taught aikibudo (an early name for aikido) to the Kanton army and the Imperial Household Agency. In 1938 he became an assistant professor at Kenkoku University in Manchukuo. He went on to be awarded the first 8th dan in aikido (1940) and an 8th dan in judo (1978). Maybe it took a while for the karate guys to adopt Kano's kyu-dan belt rank system. Maybe karate was at that time more of a rural thing and they weren't as interested as the cosmopolitan judo guys in record-keeping. Maybe this was just a curious oversight on the part of the Karate authors at Wikipedia. Or maybe this suggests a real difference between judo folks and karate folks in how they think about the rank thing.